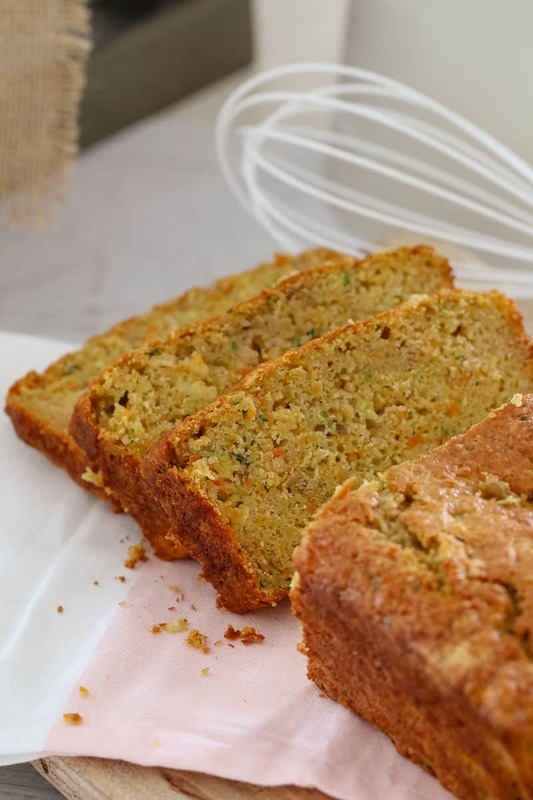 A simple (and nut-free) Apple, Zucchini & Carrot Bread that is moist and delicious. Perfect for lunch boxes or an afternoon tea treat! Hello there!!! Thanks for popping by! 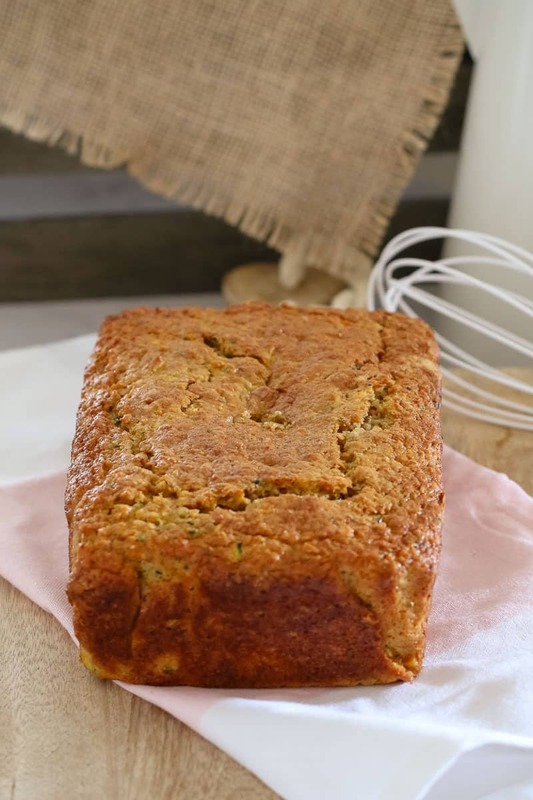 I’m so excited to share my Apple, Zucchini & Carrot Bread recipe with you today. It is a GOOD one – I promise! I’ve had a bit of a thing with sweet breads/loaves going on lately. 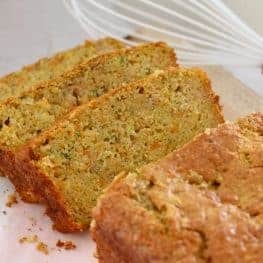 It started with my good old classic Banana Bread, my totally rich (and delicious) Double Chocolate Banana Bread, my Lemon Glazed Strawberry Loaf… and then ended up with my Zucchini Chocolate Chip Bread and THIS delicious little creation. 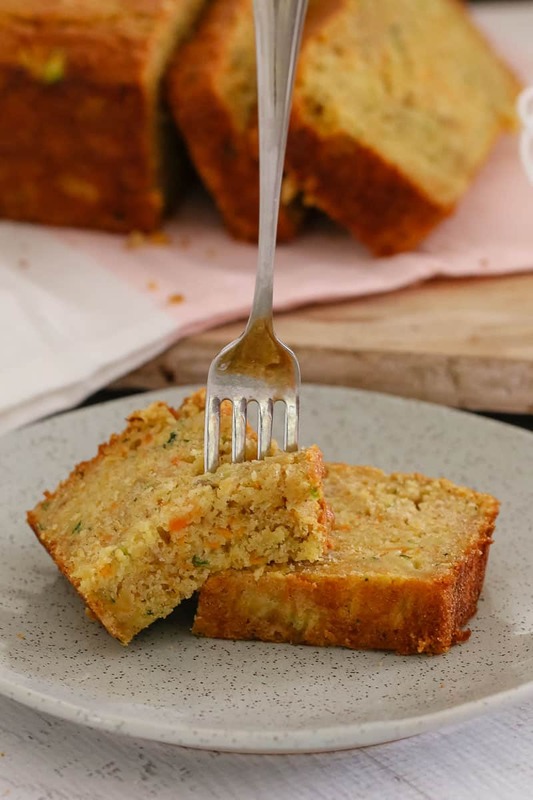 This Apple, Zucchini & Carrot Bread is so simple to make (check out the video below to see what I mean!). It’s also the perfect way to smuggle a few veggies in to your day. 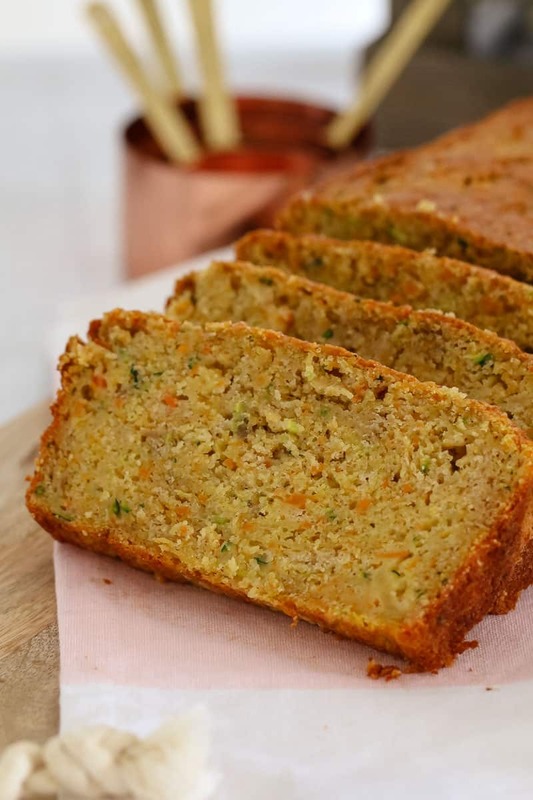 This Apple, Zucchini & Carrot Bread is completely nut-free so it makes a great lunchbox option. It can also be cut into slices and frozen for a quick and easy grab-and-go snack. 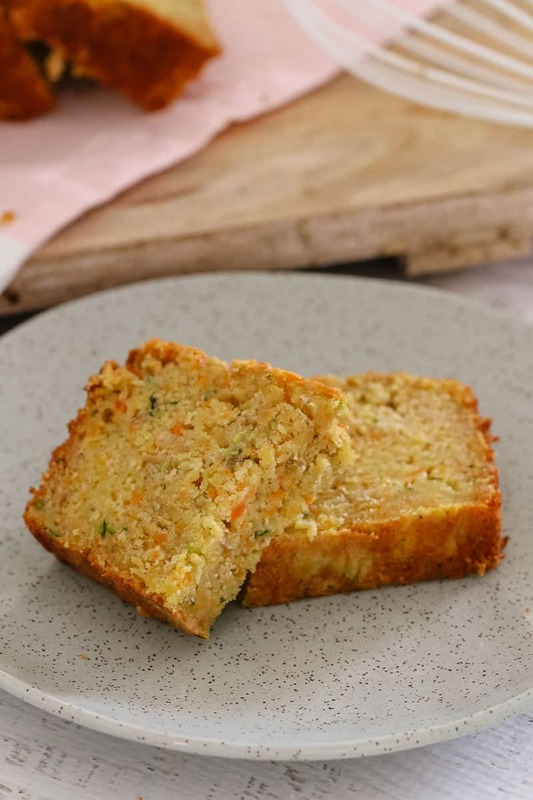 Whether you’re planning on making this for school lunch boxes or simply want a yummy treat for yourself, trust me… you neeeeeed this in your life!! Easy and delicious… it doesn’t get any better than that. 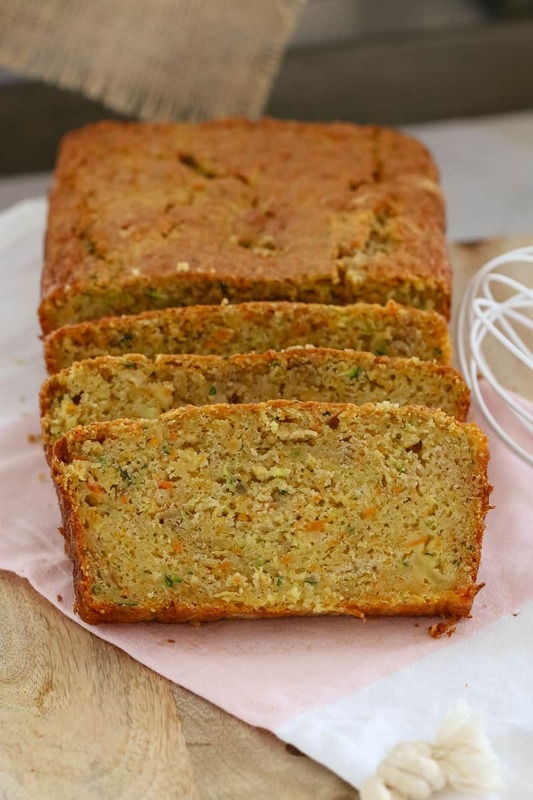 Want to see how simple it is to make my Apple, Zucchini & Carrot Bread? Watch the video and see for yourself!! Preheat oven to 180 degrees celsius (fan-forced). Grease and line a deep loaf pan with baking paper and set aside. Sift the self-raising flour, bi-carb soda, salt and cinnamon into a bowl. Add the caster sugar and mix together well. Make a well in the middle of the ingredients. Add the lightly beaten eggs and the melted coconut oil and mix together. Add the grated carrot, drained zucchini (see note) and apple and fold through. Spoon the mixture into the prepared tin, smooth down the top with a spoon and bake in the oven for 50-60 minutes or until cooked through when tested with a skewer. Leave to cool in the tin for 10 minutes before carefully transferring to a wire rack to cool completely. Store in an airtight container at room temperature for 4 days or freeze for up to 1 month. Strain the excess liquid from the grated zucchini by placing into a strainer and squeezing with a tea towel or paper towel. If your bread is browning to quickly in the oven, lightly place a sheet of foil over the top and continue cooking. Place the zucchini into the Thermomix bowl. Grate by pressing Turbo 3-5 times or until grated. Place into a strainer and squeeze out any excess liquid (see notes). Set aside. Place the carrot and apple into the Thermomix bowl and grate by pressing Turbo 3-5 times or until grated. Set aside. In a clean and dry Thermomix bowl, add the self-raising flour, bi-carb soda, salt and cinnamon and sift by pressing Turbo 8 times. Add the caster sugar and mix on Reverse, Speed 4, 10 seconds. 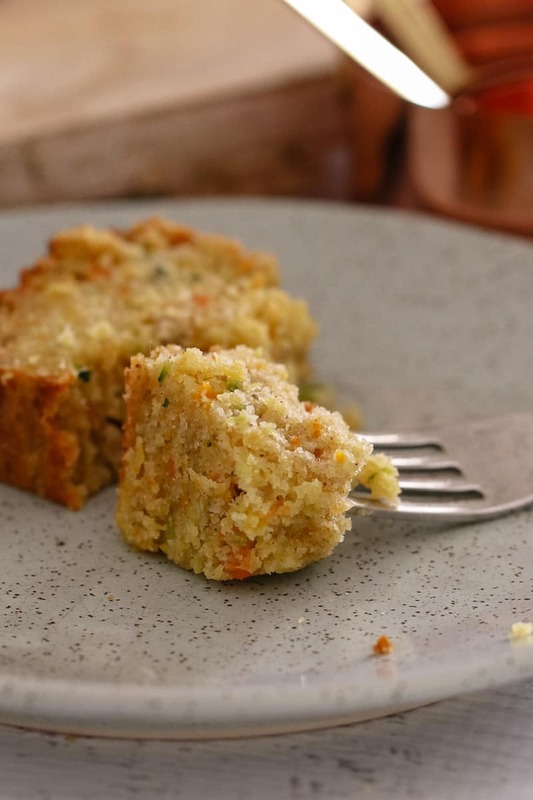 Add the lightly beaten eggs, the melted coconut oil, the grated zucchini, carrot and apple and mix on Reverse Speed 4, 15 seconds or until completely combined (use the spatula to assist). This has become a family favourite, and is sliced up and stored in the freezer for lunchboxes (that’s if it doesn’t all go on the day of baking.